What is data driven attribution? 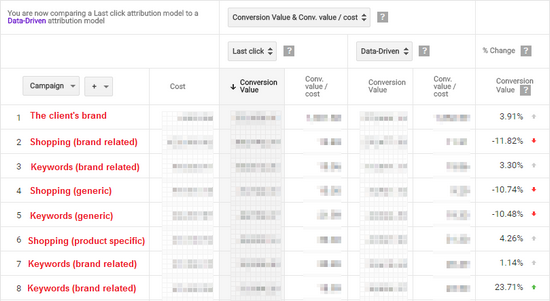 Googles data driven attribution method is supposed to better attribute conversions to ad clicks than the other, rules-based models. Instead of attributing conversions according to a fixed rule (like last click takes all), data driven attribution aims at finding the correct contribution a touchpoint made. To do so, it looks at click paths, both converting and non-converting, and uses machine learning to find the right weights. 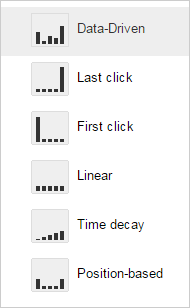 Here we have two click paths: One converting at a rate of 3%, another one converting at 2%. The difference between those two paths is that the first one has an additional touchpoint with the keyword “great tech gifts”. The additional 1% conversion rate is therefore attributed to this keyword, meaning the keyword gets attributed one third of the conversions from this path. While this example is fairly straightforward, reality is usually not that simple and Google’s data driven attribution is virtually a black box. This means that advertisers basically have to trust the algorithm. While the method itself is a black box, the results are not. 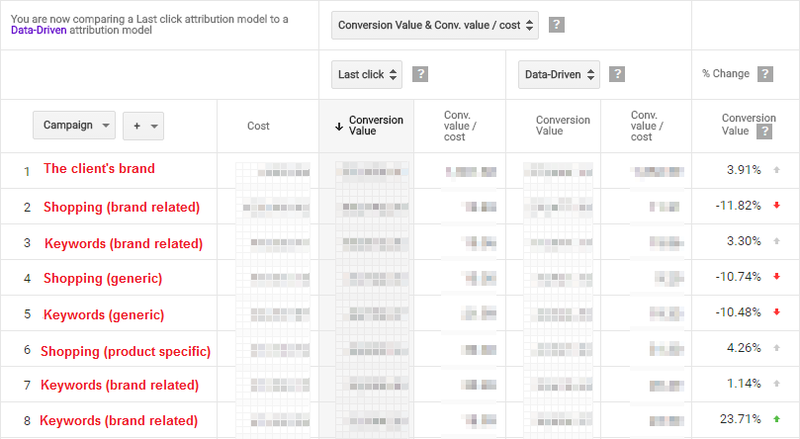 Last week, Google has quietly added data driven attribution to the attribution modeling interface. Using this tool, we can see and analyze our results as if they’d been attributed according to the new method. If you’re not familiar with the tool, you can find it at Tools > Attribution > Attribution modeling. It lets you simulate and compare the results that different attribution models would show for your campaigns, adgroups, and keywords. Note that data driven attribution can only be simulated for conversion actions with at least 800 conversions, and for accounts that received at least 20,000 clicks, both in the last 30 days. If your account doesn’t meet these requirements, the option to simulate data driven attribution won’t even show up. Otherwise you’ll find it pre-selected, along with last click attribution. The simulated data for data driven attribution is available starting February 11th 2016. If you select a date before that, the results from data driven attribution will actually reflect last click attribution. I had to pixelate the costs and conversion value for client protection, but the interesting part is there: In the last column you can see the actual difference between the two models. Read: For the first campaign, conversion value would be 3.91% higher if we used data driven attribution. By the way: This is just one client. Other clients have different results, so this is not to be generalized. My structure basically segments keywords according to how far they are down the buying funnel. Generic terms are at the beginning of the funnel, so I’d expect them to be undervalued by first click attribution. And in fact, first click attribution would add 15% to this campaign. Data driven attribution, however, still sees them overvalued attributes more than 10% of their value elsewhere. The product specific terms on the other hand are far down the funnel, basically collecting people who are ready to convert. However, the data driven approach sees them undervalued by last click attribution and adds a few percent. For the regular keyword campaigns the same is true: Generic terms are evaluated even worse according to data driven attribution whereas campaigns further down the funnel get more conversions attributed to them. If we take a closer look, there are indeed big differences between campaigns. There’s even a smaller one (not in the screenshot) for generic terms that saw an increase over 900%, suggesting that data driven attribution really looks at individual cases. What’s most surprising is the first campaign, the client’s own name. This brand campaign does little to nothing to convince anyone to buy, but it’s at the end of many converting paths, leading to strong results from a last click perspective. Yet Google’s data driven attribution attributes even more conversions and value to this campaign. When analyzing these results I found myself thinking “oh, this campaign is really doing (or worse) better than expected” – as if data driven attribution held the answer to how these campaigns were really doing. With complex issues like attribution it’s easy to fall back on easy answers, like the idea that an algorithm probably knows best. “Data beats opinion” and all that. Except that when it comes to the brand campaign, I actually do know better. I can understand how the system arrived at the conclusion that the brand campaign had so much value: Users intending to convert are more likely to have a touchpoint with the brand campaign. However, the system is designed to trace conversions back to touchpoints. It cannot distinguish between cause and effect, but it’s hard wired to interpret touchpoints as the cause of conversions. The example of brand conversions demonstrates well where data driven attribution has its limits. Now the question is whether the approach works well overall or not. Even though we can’t exactly see how data driven attribution comes to its conclusions, we can check the conversion paths that lead to its decisions. To do this, we can use the Top Paths report (Tools > Attribution > Top Paths) and compare it to the simulation. It actually contains all converting paths that are considered in the simulation as well. To get the more detail, we can drill down to the keyword level in the report and in the simulation. To further narrow things down we can also minimize the timeframe to one day. Now we can start with any result from the simulation and look it up in the paths. For example, if a keyword has 0.5 conversions according to data driven attribution, you can search this keyword in the converting paths (I recommend downloading the entire report and do the rest in Excel). Since these keywords were for completely different things, I imagine I would’ve attributed more than 30% to the last one. In this case the keyword got awarded 0.01 Conversions, which seems to be the absolute minimum. This seems to be OK.
It’s hard to look beyond a few small examples, which excludes cases where more data is available and makes this analysis far from representative. But it suggests that there are cases we can agree with and others, where we can’t… and probably many cases where it’s debatable (maybe including my examples). Data driven attribution sure isn’t perfect. In fact, it could never be perfect since the decision to convert happens inside a user’s head. This is why we could endlessly debate even the simple examples from above without ever finding out the truth. Google doesn’t sell its data driven attribution as the perfect method. According to the principle that all models are wrong, but some are useful, Google seems confident that its approach is at least better than the others. It’s hard to evaluate whether this is actually true. Google’s advice is to simply try it out, change bids based on the new model, and see whether the total number of conversions increases. The problem: It’s usually hard to distinguish between the effects of such changes and the regular fluctuations that happen in almost all accounts. Looking at the results from the simulation, especially regarding brand traffic, I’m rather sceptic about the new approach. In my opinion, the distinction between cause and effect is the central problem with attribution – regardless of machine learning and other buzzwords. I am, apparently, the only one who sees this as a problem, though. In any case, attribution is a big deal and the chance to select a different attribution model could have a big impact on the way we run our campaigns. I’m actually surprised that Google has been rather quiet about it, both officially and in their communication towards agencies. I expect this to change once the new attribution models are available in all accounts. After all, it fits well with Google’s narrative about micro moments, which is about valuing all touchpoints. My guess is that Google will then try to establish data driven attribution as the new standard method for bigger accounts. After some time they might even do one of these migrations with an opt-out form to get lazy advertisers on board. For most advertisers, the process could go rather smoothly: Change the attribution model, wait and let bid management do the rest. The hardest part will be to explain the perceived loss of performance that comes with switching from the last click model to any other one, due to the bigger time lag (the lag between the last click and the conversion is naturally the shortest). After an advertiser has switched to a new model, there’s probably no reason to deal with the topic anymore, which is why I don’t expect it to be something we’ll be talking about forever. Still, hot topic or not, this is probably the biggest deal for AdWords advertisers in 2016.